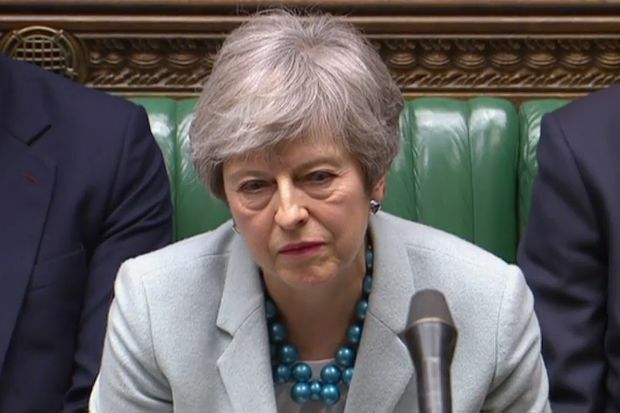 Britain's Prime Minister Theresa May listen as oppositin leader Jeremy Corbyn speaks in the House of Commons in London on March 25, 2019. At her weakest after parliament seized control of Brexit on Monday, May has yet to give up hope of getting approval for her deal to leave the European Union, which she says is the only way of ensuring an orderly exit that will safeguard business. Parliament’s move seemed to have focused minds, with some eurosceptic lawmakers saying they could back her plan before choosing a new leader for the next phase of talks with the EU. But as yet her Northern Irish powerbrokers are still opposed. One lawmaker from her Conservative Party said the prime minister’s decision to address the party’s so-called 1922 Committee at 1700 GMT on Wednesday suggested she could set her date of departure to win over that support. Nearly three years after the 2016 EU membership referendum, and three days before Britain was supposed to leave the bloc, it remains unclear how, when or even if Brexit will take place, with parliament and the nation divided. May could try to bring her deal back to parliament on Thursday for a third vote on Britain’s biggest trade and foreign policy shift for more than 40 years, but her spokesman said the government would only do that if it had a chance of winning. Her cabinet team of ministers met on Tuesday, digesting Monday’s votes but also trying to plot a way of winning over the 75 lawmakers it must convince to get the so-called Withdrawal Agreement negotiated with the EU through parliament. “They had a long discussion both in relation to the votes which took place last night and on the work which is ongoing to build support for the government’s deal to allow us to leave the EU in an orderly way as soon as possible,” the spokesman said. The spokesman said May would “engage constructively” with lawmakers who seized control of Brexit in parliament on Monday but gave them a warning - there is no point supporting different options that the EU will not negotiate. With lawmakers poised to promote several possible options, ranging from a no-deal Brexit to staying in the EU, parliament has come to the point when it must decide how to proceed. While some lawmakers suggested a tweaked version of May’s deal could finally win their approval, the threat of a softer Brexit or long-delayed departure was focusing other minds. Jacob Rees-Mogg, the leader of a faction in May’s Conservative Party demanding a clean break from the EU, said the choice now seemed to be between May’s deal or no Brexit. “I have always thought that no-deal is better than Mrs May’s deal. But Mrs May’s deal is better than not leaving at all,” Rees-Mogg, who has described the deal as leaving Britain “a slave state”, said in a podcast. Another eurosceptic Conservative lawmaker, Michael Fabricant, said he too had come to the same “dreadful conclusion” that May’s plan was the “least worst option but the only practical way forward for now”. Northern Ireland’s Democratic Unionist Party (DUP), which props up May’s government, said it had not changed its position after Sky News reported its lawmakers would prefer a long delay to allow for a change of leader and a new deal. In yet another blow to May, who saw three more ministers quit her government, lawmakers wrested control of parliament’s agenda from the government, opening the way for a series of votes on the different Brexit options on Wednesday. The government has said the deal May agreed with the EU in November was the best way to leave the bloc and Brexit minister Stephen Barclay has warned parliament it might be on the way to forcing a new election. But lawmakers who support the so-called indicative votes said only they could offer a way forward and were holding a frenzy of meetings to work out how to stage them. “The bottom line is that something has got to change,” said Steve Brine, who quit as a junior health minister in May’s government in order to vote against her on Monday.